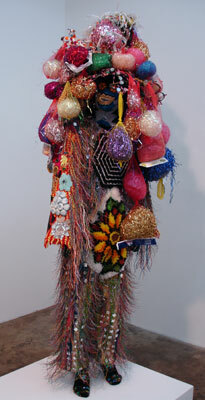 While checking out galleries this past Friday, I was fortunate to walk along 20th Street and immediately be drawn into Jack Shainman Gallery by Nick Cave’s “Sourndsuits.” Cave creates incredibly beautiful and detailed visual confections as costumes and wall pieces. 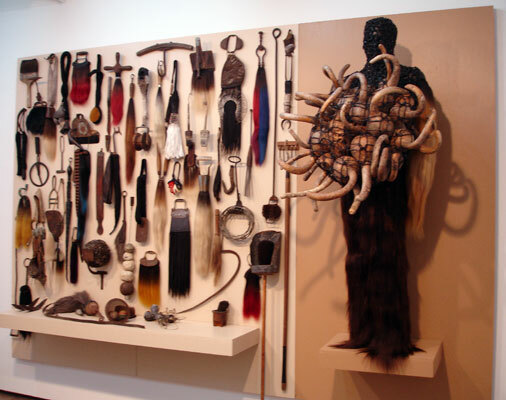 At first I was reminded of Jim Drain’s incredible costumes, but Cave’s work seems to draw more directly from ritualistic costumes of other cultures. 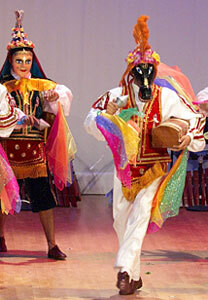 For example, a costume with a donkey head immediately reminded me “El Macho Raton” one of the characters from El Gueguense, a Nicaraguan folkloric play, pictured to the right. 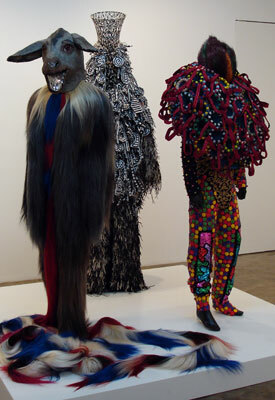 In the gallery presentation, Cave co-opts ethnographic displays of natural history museums.Â He is at once playing the role of author and ethnographer.Â As I walked out, my friend Isabel and I wondered if he was merely capitalizing upon the culture of others.Â However, in investigating Nick Cave’s work, there seems to be a lot more to these costumes.Â Cave designs them for performance, they are part of an ongoing series that will come alive on stage. 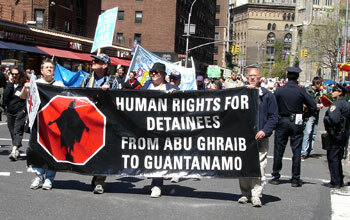 Also read an interview concerning the public intervention with Emanuele Guidi. 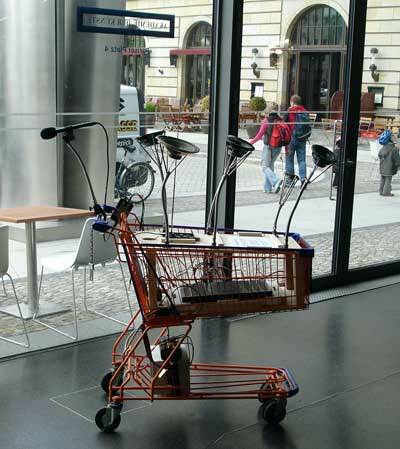 As sonambiente, the festival for hearing and seeing wraps up, the Public Broadcast Cart will be used for a free outdoor concert of noise and experimental music featuring ap/xxxxx, B Component, saal-c, OLYVETTY, the rottt (the return of the thinking thing) and lekronk. 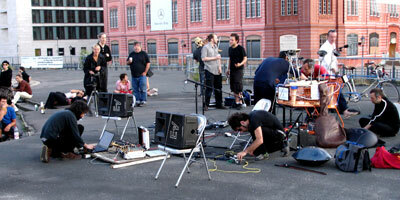 Copa Sonar, Friday 14 July, 7-9pm at Schlossplatz off of Unter din Linden, Berlin mitte. Free beer and wine will be served. 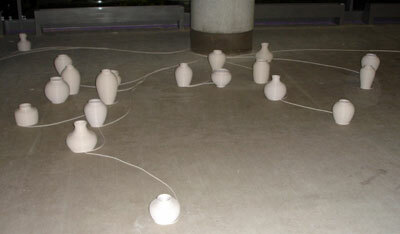 Organized by Marco Barotti and Emanuele Guidi in collaboration with sonambiente. The group of projects featured at the old Polish Emabssy on Unter den Liden, I believe comprises the strongest set of works of sonambiente. From low-tech to high, from highly socially oriented works to articulations of new forms of mapping our Earth, the Polish Embassy features a wide array of art for seeing and listening. I will only discuss the ones that I most enjoyed. 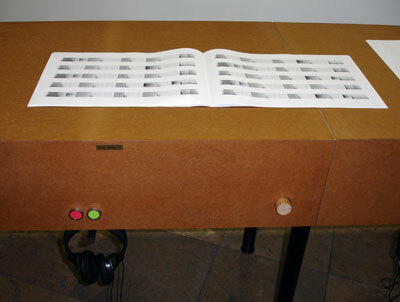 Amongst the most powerful works on display in sonambiente is Artur Zmijewski’s “Our Songbook” (2003), a video that collapses social history with subjective memory or more appropriately the fading of personal memories and national identity due to war and social misconduct. “Our Songbook” features elderly Polish Jews who emigrated to Israel during or after WWII, now nearing the end of their lives at a nursing home in Tel Aviv. 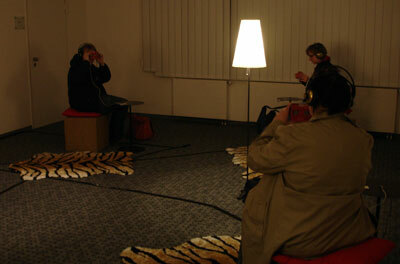 Upon visiting with these people, the Polish artist asked them to try and recall Polish songs of their youth. Few remember the entire songs, some only recall the refrain. The video is stirring and reflects the pain of dislocation, even after several decades. As I am someone like so many others today who grew up between two countries and does not necessarily feel a strong sense of nationalism, the video is awe striking due to the well-embedded desire to rekindle the actors’ sense of nationalism. Both the larger GP4 (Global Player 04) and it’s much smaller sibling GPod are on display transmitting the sounds of the Earth. Jens Brand has made audible the real-time data of over 1500 satellites so that you may listen to the Earth in the comfort of your home or now with GPod while you are on your way to work or jogging. 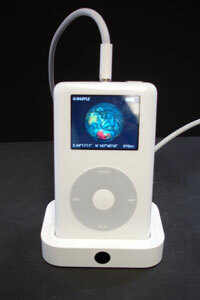 The GPod displays 3D model of the Earth, along with the coordinates tracked by the satellite that you select. You may listen to the low rumble of canyons or the high pitch of mountain peaks. Anything may be converted to data, mapped and computationally manipulated, the end result is left to the producer’s imagination. Another personal highlight of this festival is my discovery of Joanna Dudley, an extraordinary, multi-talented and powerful artist. 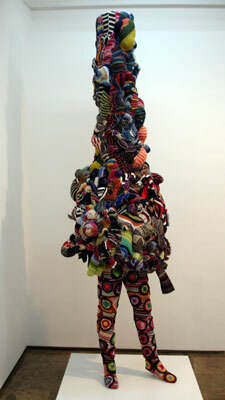 I write this not so much because of her installation at the old Polish Embassy, which I did enjoy, but moreso due to further research into her work and the concepts and approaches described in her more theatrical exploits, so please have a look at her site! 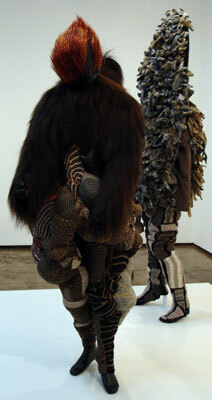 I haven’t seen her perform, so I might be mistaken, but based on the documentation the work seems very exciting. 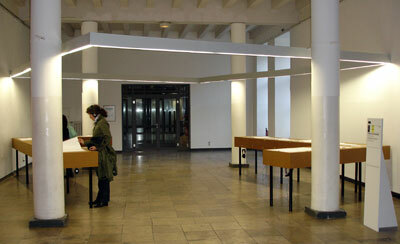 As sonambiente berlin2006 is spread out throughout Berlin mitte, several large scale installations are located at both Akademie der Kunste in the old east and west of Berlin. 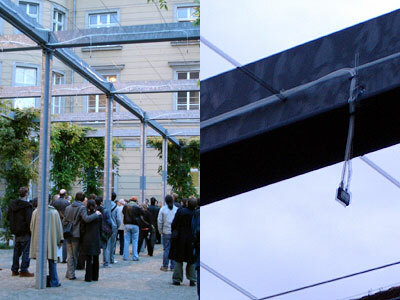 Below are a selection of projects installed at Akademie der Kunste at Pariser Platz, on the old East side of Berlin. Their were several other projects, but I only documented the ones that I was intrigued by. 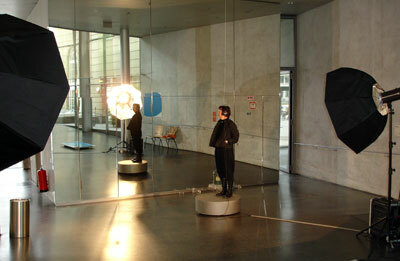 Near the entrance of Akademie der Kunste sits Jan-Peter E.R Sonntag “Modern Minimal Disco” where one stands on a round steel pedestal that feels as if it is hiding a giant subwoofer while bright lights shine on you as if you were the center piece of a photo shoot and if that isn’t enough attention behind one is a wall sized mirror with the listener as the focal point. The audio presents a narrative that follows a progression that reaches nerve wrecking peak while the pedestal rumbles under one’s feet, the lights shine and the listener begins to reach a club like ecstasy. And across from this soccer balls sits an isolation room where one may lay down and escape all the hysteria of the World Cup. As one continues into the next gallery, elegantly installed is Bernhard Leitner’s Serpentinata II in which several speakers play their own solitary audio. As one moves from speaker to speaker, one feels as if s/he is moving through a sound scape. The sounds of each speaker are incredibly crisp and alluring. 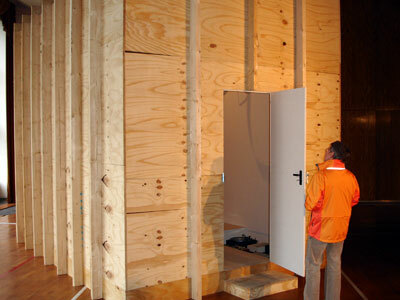 The highlight of this portion of sonambiente is Janet Cardiff and Georges Bures Miller “Opera for a Small Room.” As usual with this duo’s work they create an enthralling narrative with great technical skill. 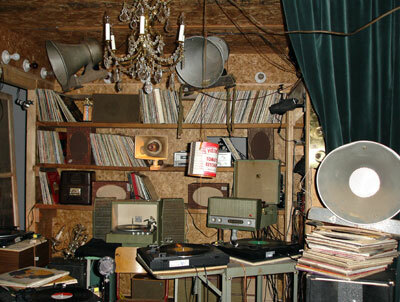 As I understand it, they have recreated the listening room of an opera lover. 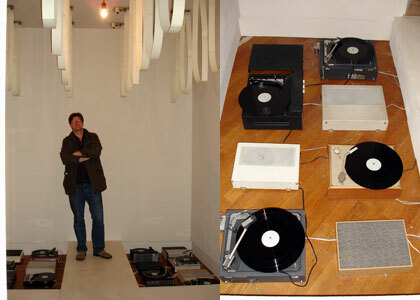 The individual may be a fiction, as the installation with exquisite surround sound, outside the reconstructed room tells a story composed of the records of the character. The installation becomes a bit Disneyesque with it’s thundering sound and flashing lights, for a moment it reminded me of Disneyland’s Tiki Tiki room in which the birds come alive and suddenly a terrifying storm comes along. I realize that this sounds like a negative critique, but in reality I absolutely love this piece, it is installation art, sound art, theater, fiction, beautifully created. Below is an excerpt of the artists description. tesla, a great space in the Berlin mitte, right across from Alexander Platz, is dedicated to the production and exhibition of new works encompassing installation, performance, sound and radio works. 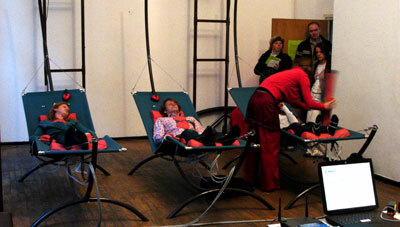 Participants lay in these hammocks that have various points of stimulation – at the hands, feet, heart and ears sound and some sort of mechanical devices embedded in pillows titillate and relax the participant. Embedded in a large steel grid that is permanently part of tesla’s courtyard is Edwin Van der Heide’s sound installation. 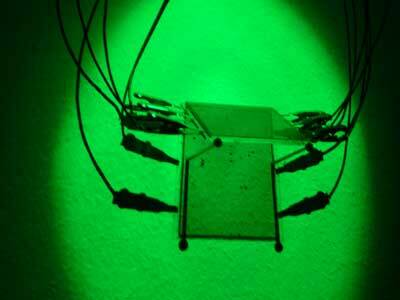 The sound is created from air shot through valves. 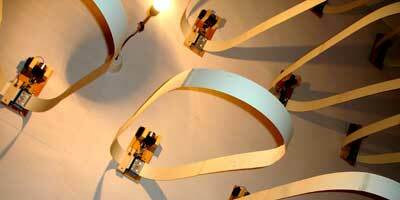 The valves are mechanized and digitally controlled to play compositions. At first the compressed air instrument is relaxing, but over time becomes abrasive as one stands below or near the pneumatic sound field. The wooden knob to the right is for the volume and red and green buttons are on/off – simple and elegant. 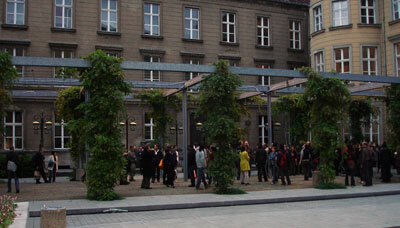 Academy of Visual Arts, Leipzig. The students listened to electronic music compositions, by artists produced by the record label of Carsten Nicolai and then created visualizations of the audio. One may listen to the composition and study the visual designs by the students. 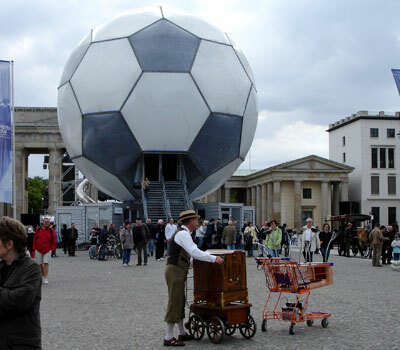 I have been given a studio at tesla, however my project, the Public Broadcast Cart is located at the Art Academy in the Paris Plaza, across from the giant soccer ball. The audio recorded when the cart is out and about will be edited and re-broadcast via the tesla radio – 1:1, 95.2FM Berlin. 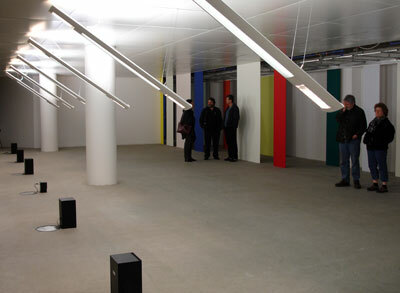 On tesla’s second floor, in a dance/meeting hall space is the installation “fades” by carsten nicolai. 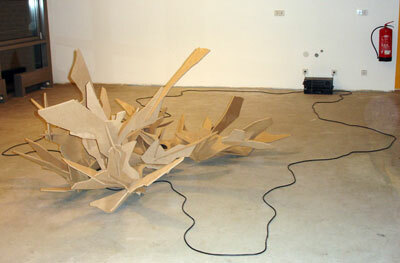 Unfortunately it’s a very dark installation that is difficult to visually document. Light, smoke and sound come together to create the installation, as light projects through the smoke onto a large black screen to accompany a surround sound composition. I’m in Berlin for the next six weeks participating in sonambiente, a sound art festival that is dispersed throughout the mitte of Berlin. And thus far this has been one of the most diverse and exciting festivals that I’ve witnessed. 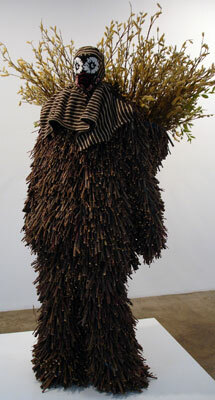 While the underlying theme is the creative use of sound, the festival is composed of performance, installation, radio, sculpture and public intervention and to boot the opening weekend is bracketed by the end of the Berlin Biennial and the beginning of the World Cup, what more could one ask for in one of the greatest cities of the world. On the opening night I only made it to one third of the evening events, so I will begin with works documented that evening and progressively present documentation of other works over the next several weeks. 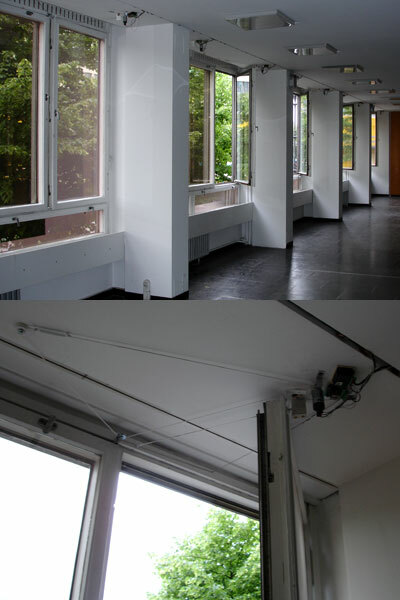 On the first of June, I made it to Allianzgebaude am Ostbahnhof, this is an office complex of which sonamiente took over the mezzane, second floor and fifth floor, in which artists were given offices and conference rooms to create installations. Appropriately this part of the exhibition is titled sonambiente_laboratorium, since many of the installations seemed unfinished, experimental or created by young artists in very hipster fashion. 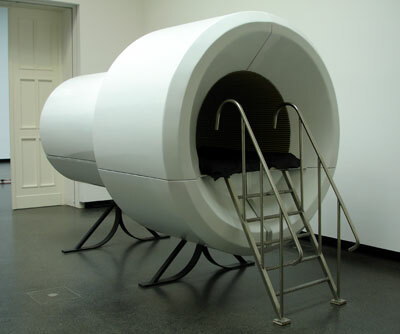 “Koexistenz” by Young-Sup Kim, 2006 in which the Korean artists recreates precious, traditional urns from white shelled audio cables that feed the audio into the speakers sitting within the urns. 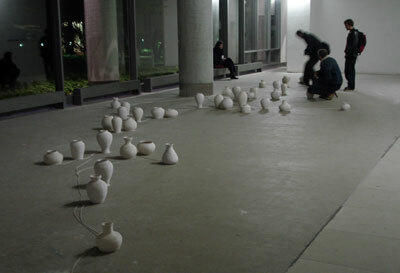 The urns are connected to play a multichannel composition of traditional Korean drumming created from household, everyday sounds. 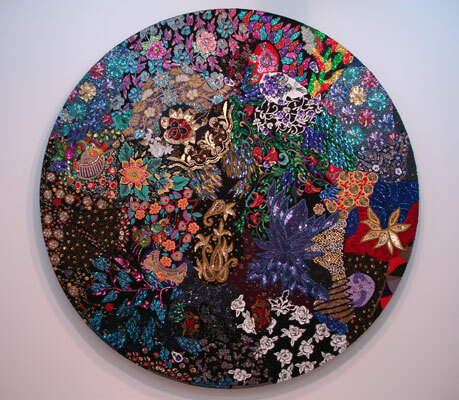 Perhaps I’m a romantic pushover, but I found this translation of two Korean traditions into contemporary art quite beautiful. “The Perfect Shot” by Satoshi Morita, 2006 is whimsical, and very well produced. 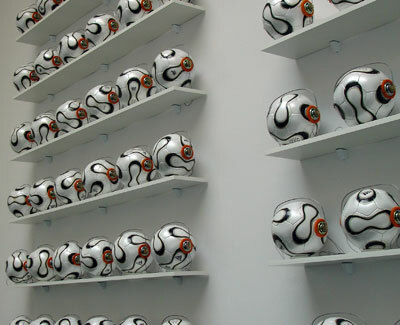 Various sports balls – soccer, golf, ping-pong, baseball sit one small green platforms with headphones plugged into the top center of each ball. Upon putting the headphones on, you hear all the sounds of the given sport from the ball’s perspective. Incredibly well produced, each audio composition presents crisp detail, from the soccer players feet running to the ball to swift kick and flight through the wind onto the next player or the ground and the scream and chanting of the arena. Or the baseballs release from the pitchers hand, through the wind, into the painful crash of the bat and through the air into a mit… Perhaps the funniest are the golf ball’s sounds of birds in the trees, and the wind rustling for a very long time, I left it before the swing of the golf club, and of course the back and forth of the ping pong. Each sound work captures the pace and excitement of the sport. All be it not my favorite work, “3HfA,” 2006 by Iris Rennert and Oliver Friedli was amongst the stronger installations as the presentation effectively establishes a 60s mini lounge ambiance. Viewers enjoy 3D images through the viewfinders. 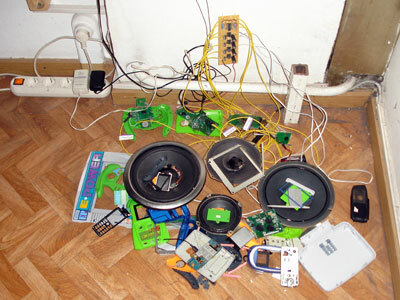 There were several other installations/projects and one performance that I didn’t document visually, since they were primarily concerned with sound. From June 1st through July 17th, I will be participating in a sound art festival in Berlin – Sonambiente 2006.Â The festival organizers have invited me to participate with the Public Broadcast Cart – traversing the streets of Berlin.Â In preparation for the festival, I have revamped the project’s website, adding to the site lots of info that others may find useful, such as how to build your own cart.Â Keeping with the goal of the project as a tool for civil empowerment and to generate discussion surrounding increasing control of dissemination media by very few wealthy private entities the site is intended as an informational repository surrounding radio transmission in the hands of the public. 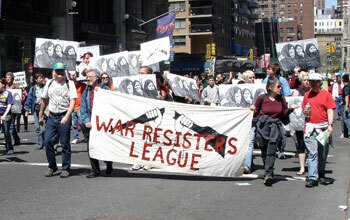 As pointless as it seems with an untouchable Bush Administration, the protest march was lively and huge! Communism alive and young in the U.S.
I’m currently teaching the senior BFA course leading to the students’ final exhibition.Â Most of the semester has been dedicated to professional development – resume building, press release, cover letters, fund raising, residencies…Â Last Wedensday however we discussed graduate school, as many of the students are interested in persuing an MFA.Â So I assemebled a presentation/discussion that I think anyone considering grad school might find helpful. There are great programs where you will be able to focus, have a strong community with faculty and peers but are located in small cities, college towns or isolated rural areas. OR you may decide that being in a major city with a strong and diverse arts community comprised of a gallery district, several non-profits and available grants for artists is where you would like to go to grad school in order to begin to establish a lasting network, this primarily means schools in or near New York City or Los Angeles.Â To use graduate school as an introduction to the art world on a national or international scope is amongst the primary reasons that people choose schools in or near NYC and LA as many of the faculty may be represented by galleries in these cities and can help introduce one to the galleries.Â This of course can be particularly important to artists hoping to achieve an independent studio practice maintained by the sales of one’s work.Â This question may point to differences between a school that is gallery oriented versus teaching oriented. This interdisciplinary program prepares artists of all genresâ€šÃ„Ã®film and video, painting, performance and installation and sculptureâ€šÃ„Ã®to successfully enter the contemporary art arena. A significant proportion of its alumni have achieved international and national reputations. More traditional programs divide their areas by medium – one must apply to painting, or sculpture, or photography, etc.Â These schools may put a greater focus on technical skills and the development of one’s chosen craft and less emphasis on theoretical and conceptual background. Do you envision yourself as an artist working in a creative field with a company, such as a design firm, an ad and publicity company, an animation or film house…? Do you envision yourself as an independent artist with a personal studio? 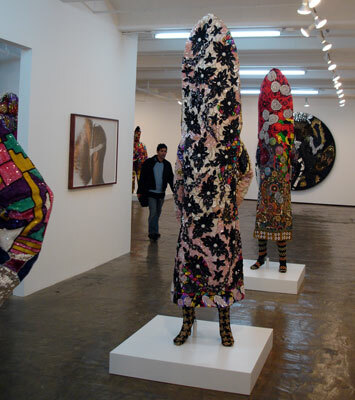 Would you seek to establish a relationship with a gallery? Would you seek a teaching position to split your time between teaching and studio work? Would you seek to maintain a studio through freelance work…? Would you prefer to establish yourself as a regional artist with an emphasis in Â Â Â Â Â Â establishing roots in a specific community? Would you prefer to establish international credentials? Would you prefer a studio practice versus a site specific practice versus a community Â Â Â Â Â Â based practice? 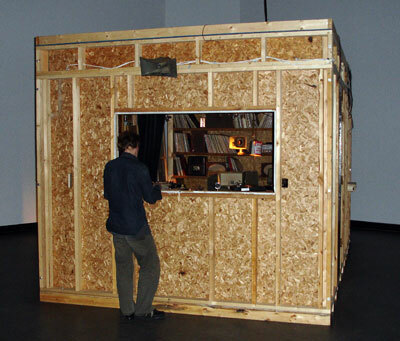 Are you an object maker versus a time-based artist (performance, electronic arts)? The point of graduate school is to seriously focus in your work as an artist, without the dilemma and distraction of a full-time job.Â Consider grad school your full-time job, if you are unwilling to do so, it’s most likely not worth your money or time to attend a graduate school in Fine Arts.Â Look for programs that offer generous funding and positions as teacherâ€šÃ„Ã´s assistant. Take time off from school to test your dedication and perseverance – will you continue producing work without the framework of school? Be willing to live minimally or simply in order to give yourself time to continue developing your work without the strain of a full-time job. When it comes to applying to grad school â€šÃ„Ã¬Â research the faculty at the school, look at the work they have produced, look at the work of the current grad students, find information on the facilities, does the school provide generous funding for their graduate students, make an appointment to visit the school if possible, and of course request all their materials. 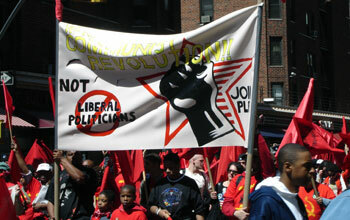 Go to the program that offers you the most money, avoid debt if possible. With or without graduate school, a career in the arts requires a great deal of perseverance, dedication, and patience.Â It is important to establish sustainable systems for your work and yourself. It is useful to create for yourself a three year plan: where would you like to be in three years, what do you need to accomplish now to get to that point?Â After the first three years, evaluate where you are and your personal satisfaction/happiness/accomplishments and establish a new three-year program.Â Eventually the three-year plan may become a five-year plan.